5 miles on the schedule today....done!!!! Still not bad outside for November. Not really running related although I would say I'm not looking forward to running in that weather. I'm also not sure about that beer part. Haha.....WTF! I am with you on that one! I hate running when it is crappy out,, but I don't own a treadmill so out I go in all but the worst weather! Love it! I actually enjoy running in snow. 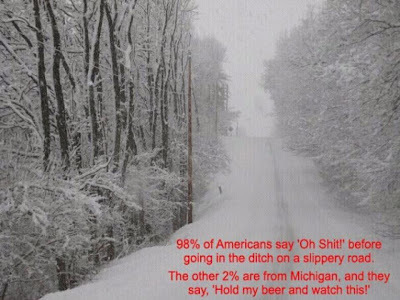 I'm originally from Wisconsin and I believe that 2% would go up there! HA! Ken - beverage yes; drinking in the car, no.